Maceral Analysis | Pearson Coal Petrography - We fingerprint your coals, coke and carbons. Maceral analysis categorizes the microscopic constituents of coal according to morphology and reflectance. It is then used to determine the proportion of reactive to inert macerals for prediction of various coal quality parameters. In our laboratories, maceral nomenclature follows the definitions of the International Committee for Coal & Organic Petrology, which are recognized by ASTM, ISO, and the Australian Standards Institute. However, the distinction between the Vitrinite submacerals, Telovitrinite and Detrovitrinite, is unreliable, and although required in Australian analyses, the subdivision is not made in North American laboratories, nor incidentally, in the ICCP’s own Accreditation exercise. In any case, we have shown that the quality of coking and steam coals is more dependant on the fluorescence of the vitrinite component rather than the proportions of the two vitrinite sub-types, (see “Coal Quality from Automated Fluorescence Imaging Microscopy” below). In addition to the carefully measured manual maceral count, we are able to provide automated group-maceral partitioning from Fingerprint data. 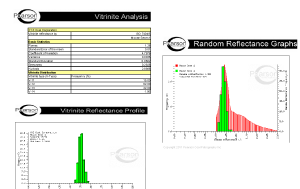 A probability plot overlay of our Fingerprint (the Reflectance Profile), provides a very quick visual appraisal of the Vitrinite and Inertinite contents of a coal. The location of the inflection point of the curve separates these two group-maceral populations, and the percentages of each can be read from the ordinate on the right of the graph, uniquely validating a manual maceral count. Petrography is used by coal-producers to evaluate the nature of coal deposits, to confirm the quality of vessel or train cargoes, and to show the uniqueness of a specific product relative to another. Steel producers use petrography as an aid in the design of coking coal blends, to help in trouble-shooting problem-cokes, and to confirm the nature of vessel or train cargoes. Steam coals can benefit from an evaluation of the Liptinite content, because Resins and Liptinites have elevated volatile contents, and strongly impact on a coal’s reactivity, and ignition stability. Our petrographic reports are intended for presentation. We know that they are sent by client coal companies to steel producers from India to Mexico, and from Brazil to Korea and Taiwan, where they are well received. The reports include information on the provenance of a sample and the methods of sample preparation, and analytical techniques used on the sample. For each coal sample received for full analysis, a summary of relevant petrographic parameters is presented as well as graphical content. Typically these reports are sent in Microsoft Excel format, but can be created in many formats available in today’s wired world. All reports are time-stamped to indicate when the analysis was completed and by which analyst. Many of our data are available online through a web portal. Access is restricted and monitored for security of client data. The reports can be generated from the web site or emailed directly to the clients. Our laboratories are equipped with backup servers and each laboratory mirrors the other laboratories data for complete data redundancy.